These past six weeks flew by at lightning speed, and it feels great to be at the finish line of the Spring 2016 One Room Challenge! 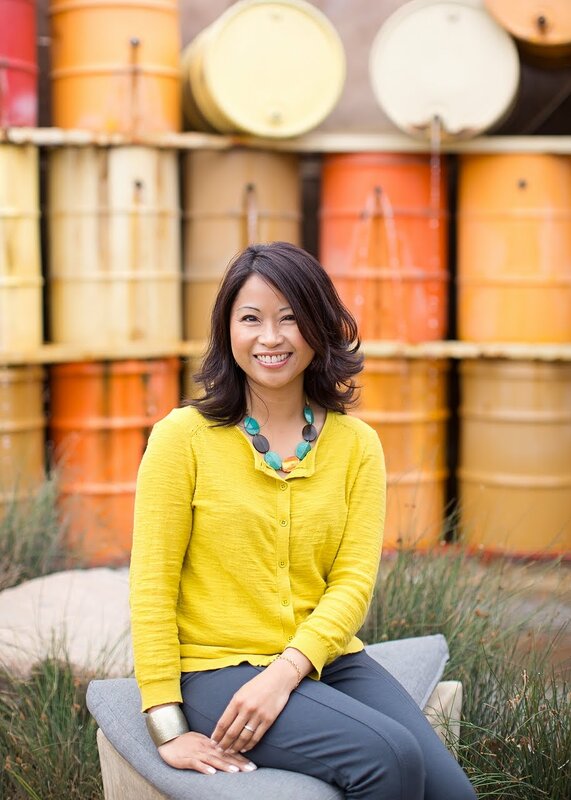 Thank you so much to Linda at Calling It Home for spearheading this semi-annual design blogger event. It was a dark and dated time capsule, just like the adjacent old kitchen which we also renovated. 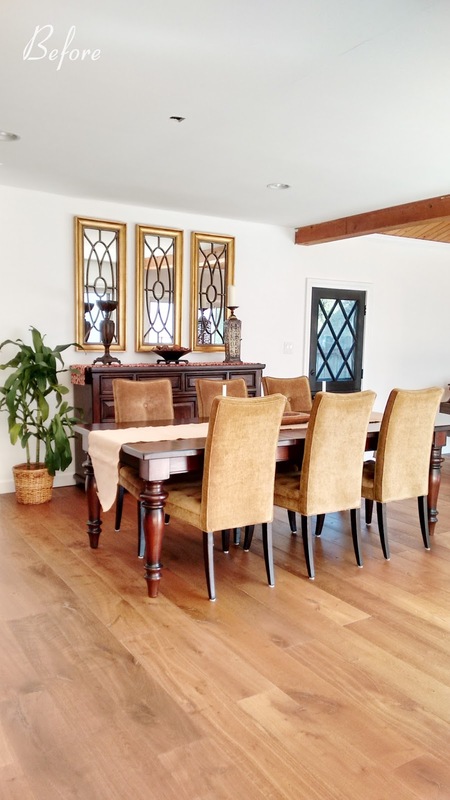 Our dining room (and home in general) has come such a long way over the past three years since we purchased our fixer upper! 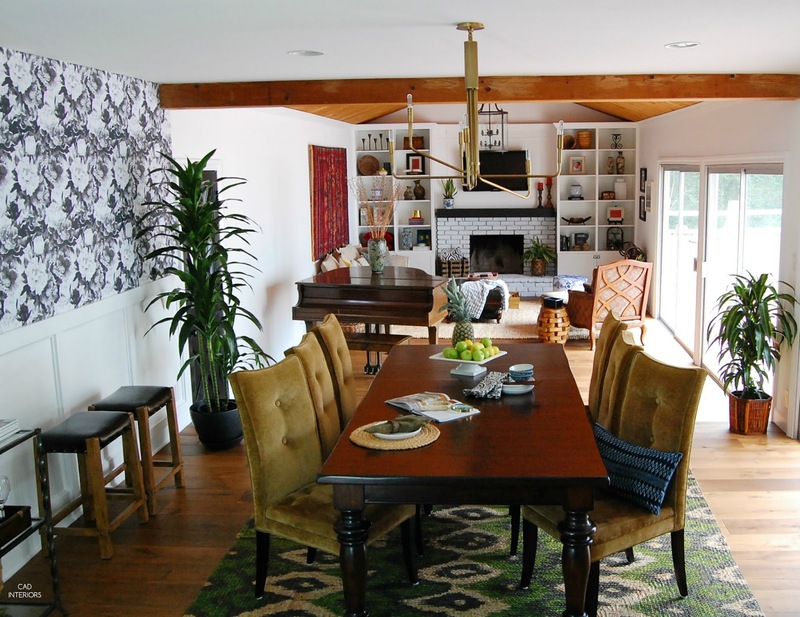 The goal of this budget-friendly makeover was to create a design-savvy space with a mid-century farmhouse spin - which is in keeping with our home's 1955 architecture and interior decor. Most of all, I wanted to inject personality and pizzazz into an otherwise lackluster space. 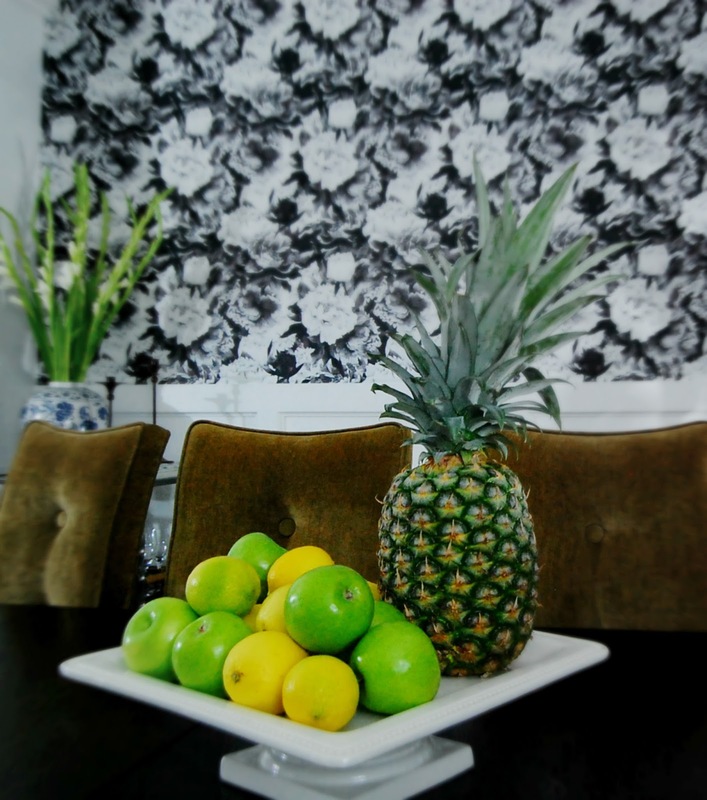 The focal wall we DIY'd accomplished just that! 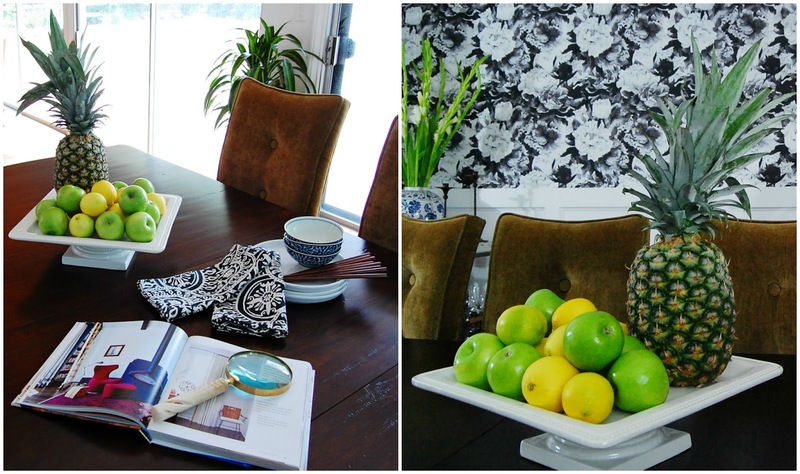 The feature wall literally transformed how the room looks AND feels! It was the main component of the design plan, and it truly is the "star" of the room! 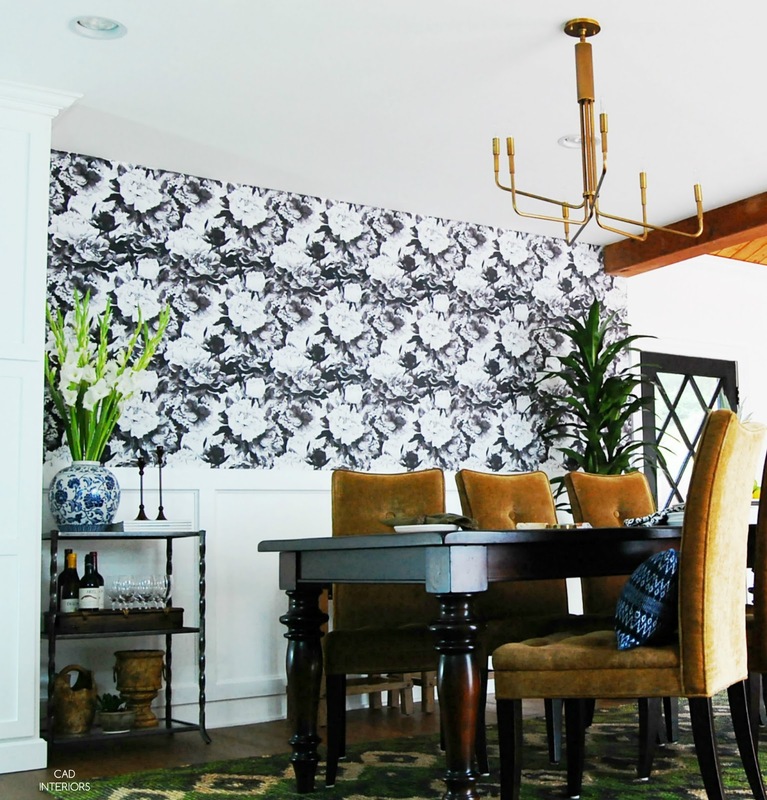 The bold graphic wallpaper added the design "oomph" I had envisioned, and the wainscoting detail provided much-needed architectural dimension. I am so pleased with how it turned out, especially after all the challenges we faced having an uneven wall! 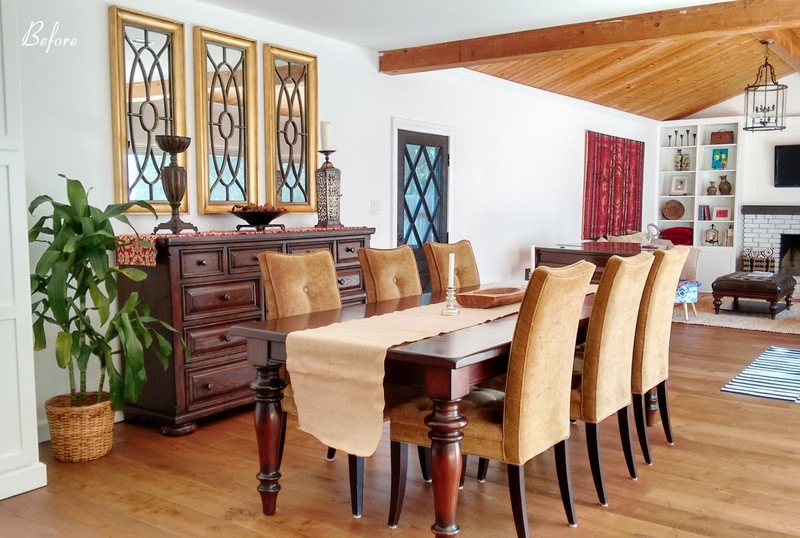 It single-handedly elevated the room's design, and it also gave the dining area its own "identity" within the open concept great room. 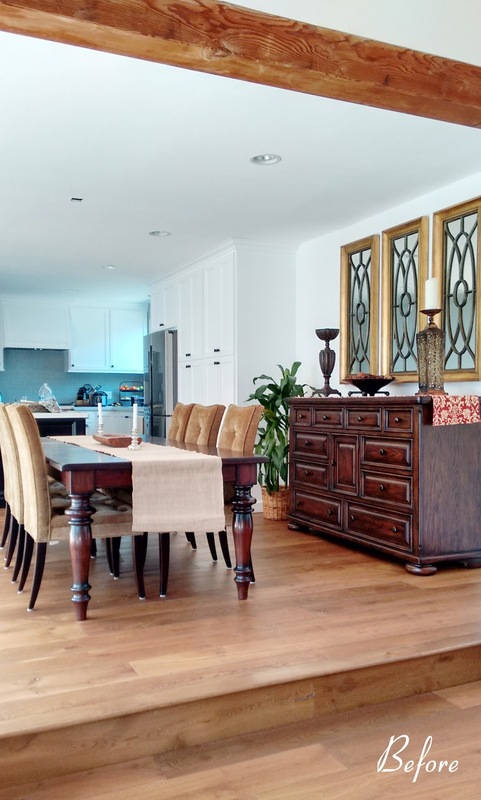 Thank you all so much for following along with our dining room makeover! Your positive support and encouragement here on the blog and on Instagram has been truly appreciated. That's a wrap on the Spring 2016 One Room Challenge!!! This turned out absolutely amazing! That light, wallpaper, rug... all of it. So, SO good! Amazing job! I've been waiting for this reveal and it does not disappoint. Why does that little pop of green make everything feel so alive? So nice! I love the layout of your home. Thanks so much, Lori!!! 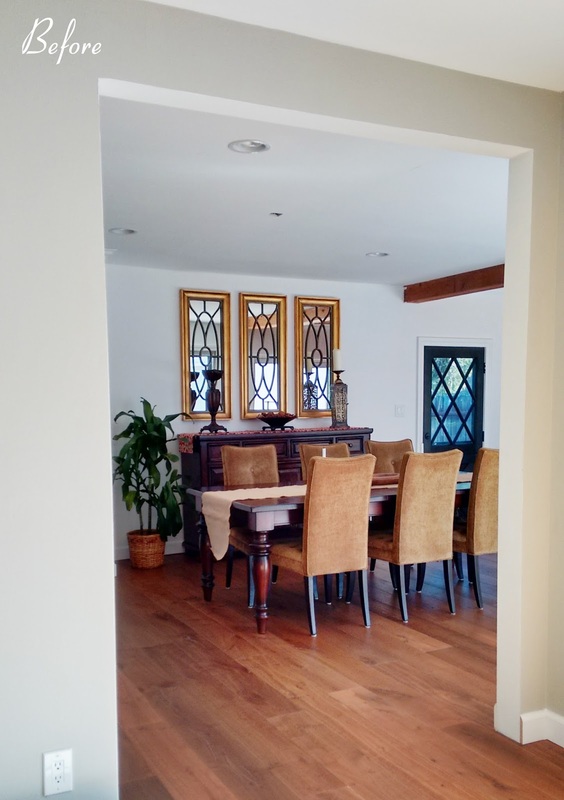 The layout of our home is how I was able to see beyond our fixer upper's many flaws. :) I truly appreciate you following our home journey. It's been a true labor of love (and time!) and I'm so glad to share the transformation here! Love that wallpaper! This looks amazing! you nailed the midcentury! The green accents totally make the room. Carol this an amazing before and after! 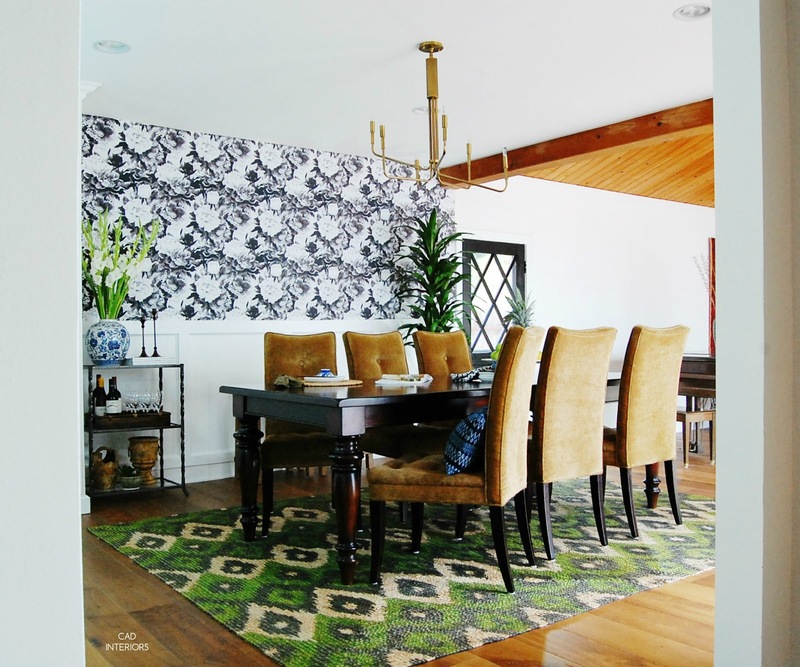 The green rug brings so much life to the space, and is a fun pairing with the black and white floral wallpaper. 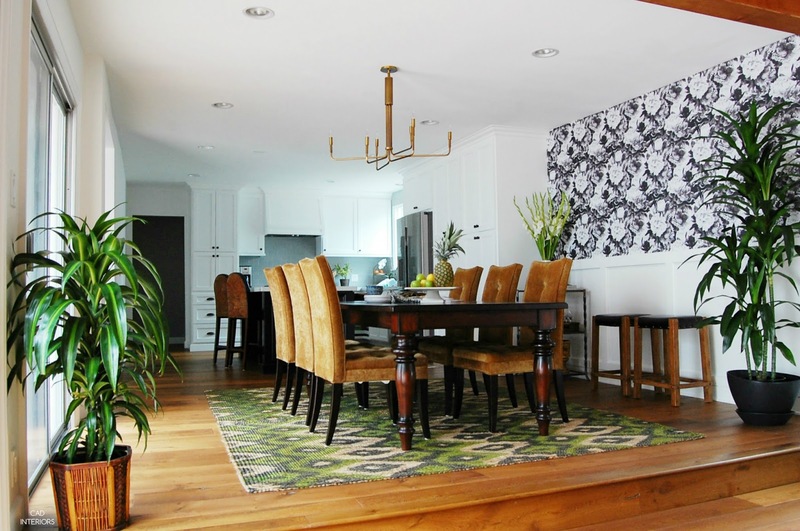 You did such a great job giving this room it's own attitude but keeping it cohesive with your family room and kitchen! Love it all. what a great transformation, carol! i love that paper- so dramatic and fantastic! Yep, love it! That wallpaper is just everything. You truly captured the midcentury vibe Carol! I love that wallpaper and the lighting you chose! Congrats and CHEERS to us for another room done! oh gah girl, that green rug is the pop that room needed. I love looking at your before pictures and just seeing your progress. one of my favorites so far. Wow, what an amazing transformation. Isn't it such a relief to be done? Congrats on a beautiful room. Visiting from Twelve On Msin. Thank you, Sara!! Yes, total relief to be at the finish line! This room came together at the very last minute because of all the unexpected curve balls in this ORC. :) Thanks for visiting. Can't wait to visit your space! Great job. You really made this electric room work. Love that wall paper! Wonderful pattern play going on in here! Love the look of the new space! SO fun and fresh! I told you on insta, will tell you here, too: The chairs work beautifully with the impressive wallpaper and the chandelier is a sharp attention to decorative detail. Love the bold and colorful room! That wall is everything! And the ceiling light... so beautiful! Looks amazing!! 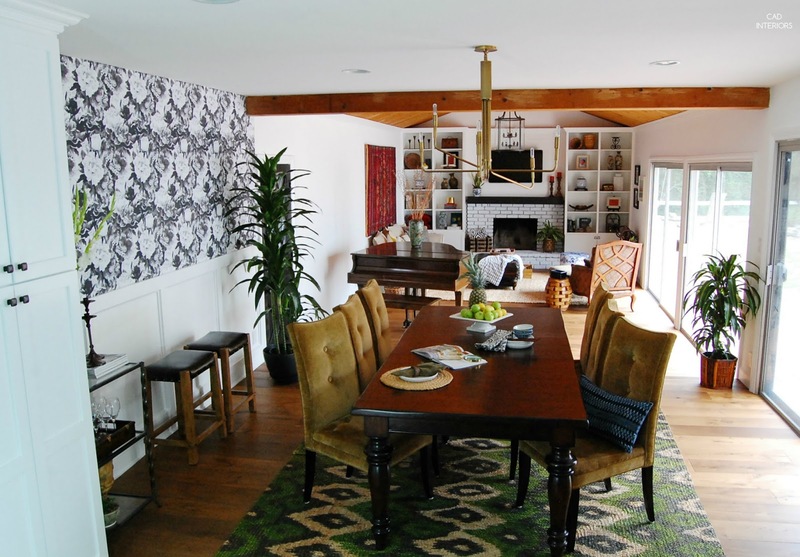 Love the space too and those ceiling beams, great work!! Oh this is great! 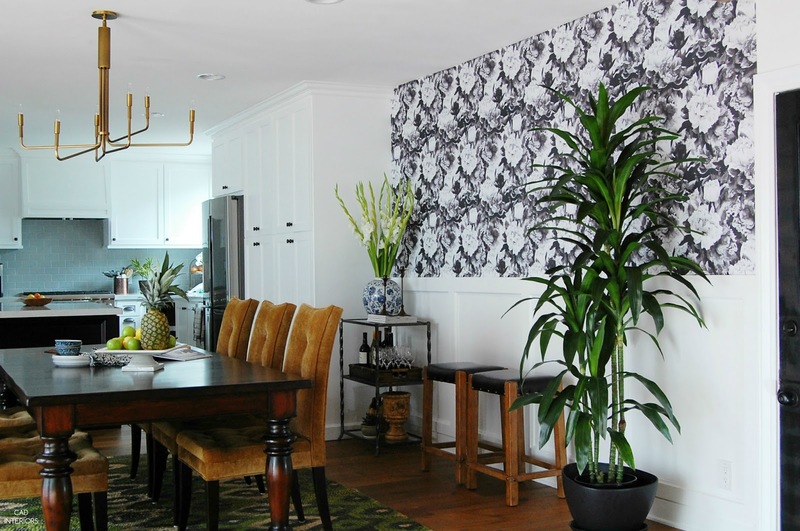 I love in spite of the open floor plan you were able to incorporate this gorgeous wallpaper into the dining room and still have the room flow into the rest of the space. Oh and that light fixture! Congrats! Thanks Tricia!! 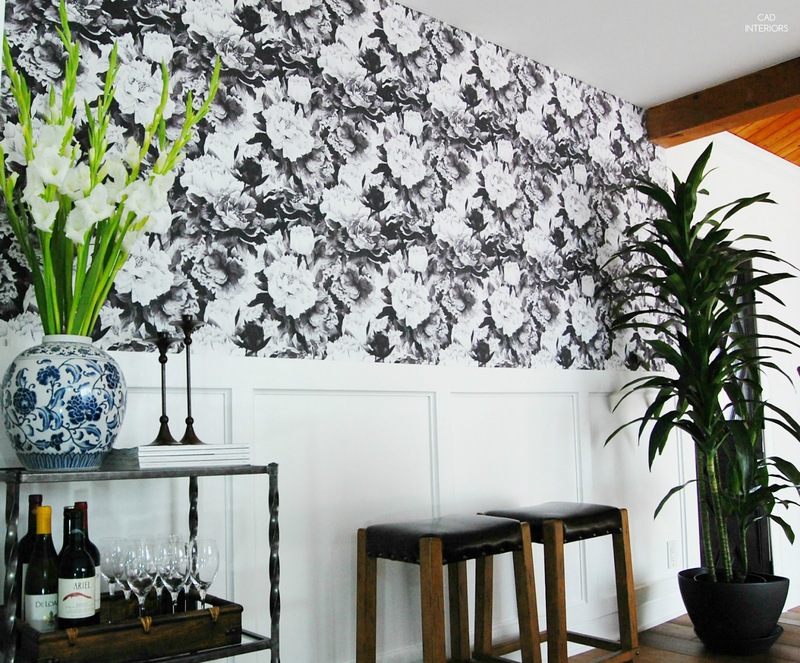 Yes, incorporating a patterned wallpaper that would flow with the adjacent spaces was tricky, so I went with black and white for a "neutralizing" effect. We love the light fixture too. It is so nice to finally have one after 3 years! Btw, I am making my way to see your room (and Erin's)! Congratulations on a job well done, my friend! 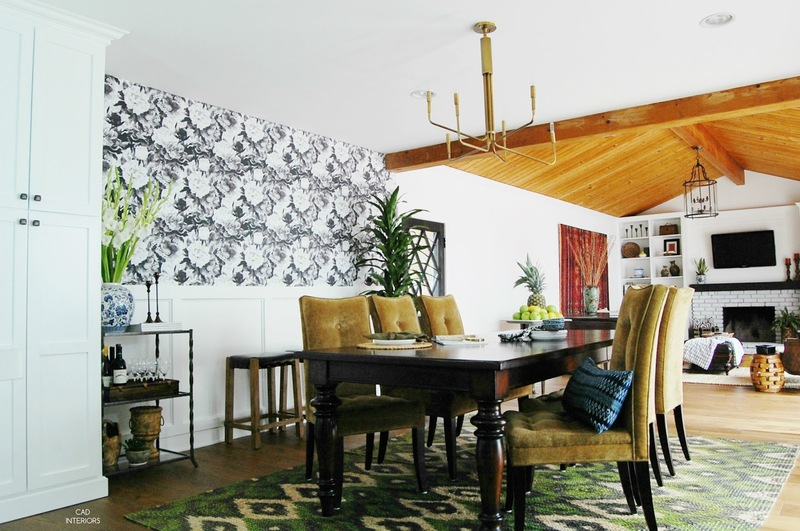 I love the light fixture and the styling in the room is superb. 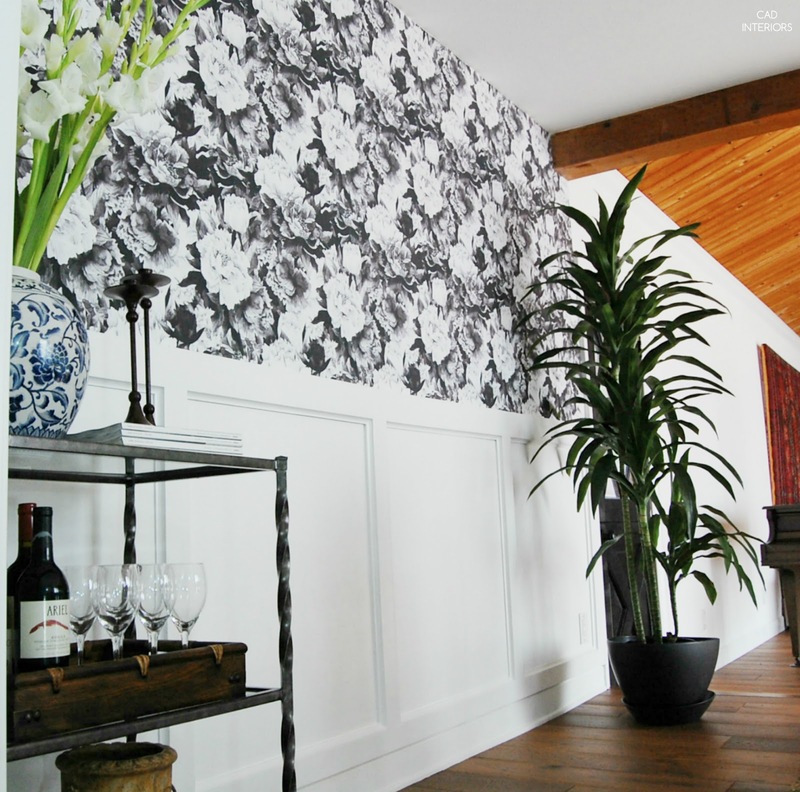 The wallpaper is such a wow factor and I love how the wainscoting creates a great balance between the boldness of the print. Love all the before and after shots! I am new here, came across your pretty room while browsing through one room challenges. Love how beautifully you re-imagined an already pretty space. All the greens are eye catching and that wallpaper is yummo :-) Happy to be here. Thanks so much, Anima! Thank you for stopping by and taking the time to leave a comment (on IG too!). Glad you liked the room. Looks fabulous! Love the rug. That feature wall certainly does make the space! Beautiful job.